For those of you who don’t know, educational degrees usually work in this progression although there are slight variations: (1) high school diploma, (2) Associates degree which amounts to around 2 years of college work, (3) Bachelor’s degree which is 4 years of college, (4) Master’s Degree = 2 years after Bachelors, and (5) PhD = 3-7 years after Master’s. If we’re going to operate on media stereotypes purely, one would assume that people pursuing higher education degrees must be geniuses, right? In fact, people in higher education get an automatic type of respect as soon as we say that we’re in our master’s or phd program; however, the privilege that comes along with being educated eclipses many of the real issues that occur in academic programs. Because academics receive automatic respect, they oftentimes forget to check themselves, or to look at how some of their actions and words may be offensive or even racist/sexist/ableist. 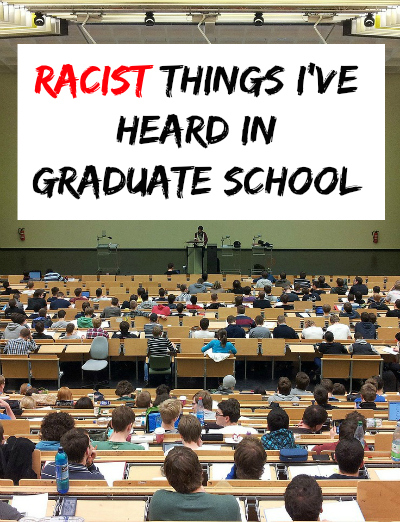 I just graduated with my master’s degree and I’ve been reflecting about my experiences, and I decided to make a list of *some* of the racist things I’ve heard over the past two years in graduate school to cope with a lot of the frustrations that I still feel. Academia has transformed into a business where it’s all about profit, exploitation, and pumping out students with degrees who are intellectually and politically bankrupt. Some of the worst offenses can occur in academic spaces because there’s a culture of arrogance where students assume that they’re so smart simply because they have publications and because they know an immense amount about one very narrow field. I was inspired to make this quick list after I read Dr. Eric Anthony Grollman’s post about horribly offensive things he heard in his program. Academic programs and classrooms can often be spaces of violence for minorities whose experiences are largely ignored by professors and colleagues. 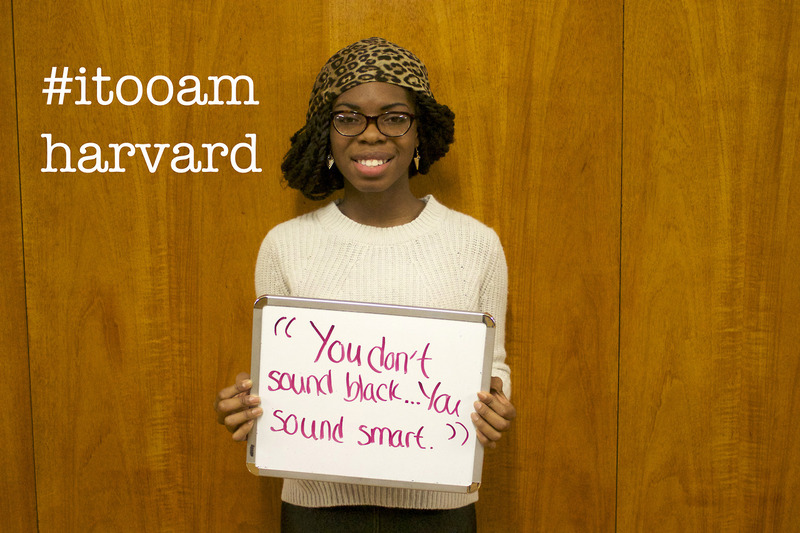 One of the photos from the #itooamharvard campaign that was protesting racism on campus. Minority students are often ignored within graduate school contexts where there’s a giant assumption that most of the stress comes from the school work, rather than the sexist, racist, ableist aggressions that we experience. (9) “Black men don’t seem to get jobs as easily as white men. I don’t know why though. They’re not as good at interviewing as white men I think.” —white PhD student. (12) On one of my blog posts online, someone from my department anonymously commented and called me a social failure who uses the race card all the time. (16) I was having a conversation with a white PhD student about where I lived. (17) One of my professors spent a whole segment in class teaching white scholars how to write about race and black people. I was the only black person in the room. Some of your examples are horrendously offensive. And I empathize. But, some are innocent and even important statements, which could be taken as an honest attempt to further the discourse about race. Specifically your 10th example, because a white person may honestly feel inhibited from talking about race for fear of criticism and statements being taken out of context or misconstrued. “Kraka” university I assume is meant to be a play on the derogatory name for a white person cracker. Right? If so, that’s not helpful. Maybe a humorous release for you, but clearly alienating for white people. Thanks for reading and responding. Sure, many white people are afraid of talking about race because of the cultural narratives that tell us race = black. I choose to lable my show “kraka” because I aim to highlight the offensive whiteness of the academy. In fact, the academy is called the “ivory” tower and I wanted to play with that a little. I don’t care if white people feel alienated by the title. I’m more concerned about people of color and other minoritized populations feeling alienated. For too often, we walk on egg shells about our experiences, and I want to put it front and center. For once, my show is really for minoriitized people…not necessarily white people. I’m talking about someone who wants to meaningfully engage with you about prejudices, stereotypes, who wants to listen and validate your experience, but also potentially contribute to the conversation with their own experience. I imagine if I had the occasion to meet you, to want to get to know you, and possibly befriend you, how difficult it might be if I couldn’t even admit difficulty talking about race – and when I say race I mean all the tensions and history and life experiences that we collectively as the human race have with the accident of birth bestowing various tints to our skin. I acknowledge white supremacy is real, and I may have had privileges that I wasn’t even conscious of throughout my life because of the color of my skin. But, again, I think for a white person who genuinely wants to grapple with these issues, and possibly engage with you in the process, being referred to as cracker would be alienating. You say that doesn’t bother you. Ok. I like your video. I am personally not offended by being called a cracker, but I think there is hostility in the way that you have expressed it here. And I accept that in many ways it is probably justified. 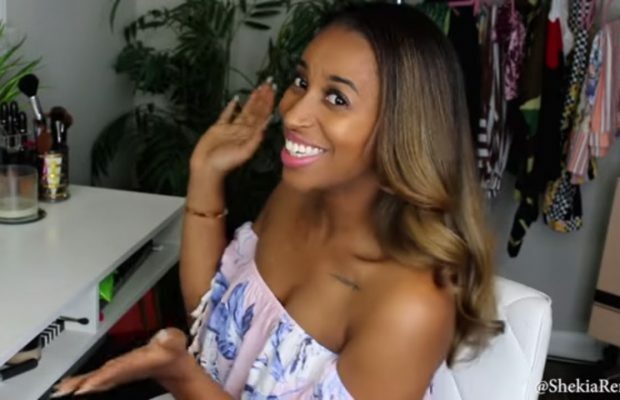 But, for those white people who just genuinely want to be accepted by you – do you think you might be making them walk on egg shells? I think you are making a difference in your writing. 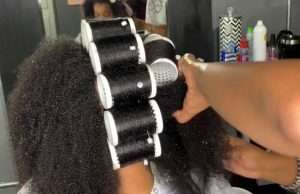 I think you are giving a voice to what many black people must be experiencing. I was glad to read it. All I ask is that you let some white people humbly acknowledge their own ignorance without chastising them for it. At some point I hope that forgiveness comes into play. Maybe we won’t be near that point in our lifetime. But, I would like to forgive myself for the accident of being born white, and I hope that you can forgive me too. AD, I think you’re misreading what is going on here. The “privilege” you talk about having yourself (that incidentally, you don’t notice — not your fault in many ways) is not something that people of color can NOT notice in their own personal and academic lives. In fact, it is thrust in our faces on a daily basis from the time we are children. So, I, like many, entered the academy thinking from an early age “Thank the gods, I don’t have to be around racist white people all the time. Academics are educated!” And then having the same, tired, and frankly obnoxious attitudes cast down upon us that we expected wouldn’t happen (at least that’s my case). I’m not black or of African descent, but I’m brown/Asian, mistaken for Latin American. So not only have I heard anti-black and anti-Mexican/Latin American things, but also anti-Asian things from whites, blacks, and other Asians (not to mention the anti-Arab/anti-Muslim things you hear on campus day in and day out from people of all backgrounds). However, just because I’ve received hostility from many white men and women, I don’t walk on eggshells trying to be “accepted” by white people, and nor should you walk on eggshells trying to be “accepted” by black people. The best way to be accepted is not say or do racist things to anyone. Period. Guess what? You’ll be accepted. When I meet non-racist people from any background, who might be curious about my background, I don’t instantly chastise them for it. Instead, I love talking about my mixed background, what it has taught me, and what it can potentially teach others about identity. However, any perceived “hostility” you see in this video, take that and multiply it by one thousand times against people of color (to the point of being bombed, killed, maimed, or otherwise physically threatened) — and your hurt feelings mean very little in the scheme of things. Trust me, getting yelled at by your own neighbor (in the “liberal” Northeast) to go back to “my own country” — from other descendents of immigrants, no less — on a nearly daily basis, and then hearing that at work at a university is FAR MORE hostile than this video, which pokes fun of clueless white folks in the academy. The tired cliche of “accidentally being born white” comes from white supremacist discourses of “reverse racism.” When white people plead for civility when women of color like Aphrodite call out their racism, I have to ask: is anger against racism more uncivil than the racism people of color experience every day, when even Henry Louis Gates can be arrested in his own house? Is killing and imprisoning people of color civil? If not, then why should we be civil when calling this out when the incivility of racism continues, but is completely ignored by the majority of white Americans? Thank you Aphrodite for this video. See the book “Ebony and Ivy” about slavery and modern American university system. The story is much deeper than this video, and goes to the very core of the American educational system. I’m so sick of seeing comments on blogs like this, where someone tells the writer to “calm down” about their personal experience, and to stop making people uncomfortable. You want to engage in conversation? By all means, do. But don’t dictate how any poc should feel about the racism they encounter. Also, instead of asking to be educated, why don’t you read some books so you can contribute something useful, educate yourself and have a better understanding? Google search books on race, gender and class. Put in some real effort in to educate yourself first, if you’re really so interested, rather than expecting others to do it all for you. Your comment was in response to mine, I believe. Nowhere did I say calm down, or dictate anything. However, I think some examples used in Aphrodite’s list are not examples of racism. I am not asking to be educated either. I come to the table already with some meaningful things to say. However, when I come across a list like this, I realize that I cannot share my experience without it being misinterpreted. And I realize I must proceed with caution before opening up. And, I probably would not feel comfortable in any forum having that conversation with Aphrodite. Calling many examples on this list racism, does not help to make progress in lessening racism. If anything, it only creates barriers to discourse, and edifies existing walls. One of my favorite books ever is called “Passing” by Nella Larsen. I have also read numerous other books about gender and race. I read both of Obama’s books and greatly enjoyed them. Not sure how many people can honestly say they’ve read them. But, his first book “Dreams From My Father” dealt heavily with race for a black person growing up in the U.S. (and Indonesia) . I have had numerous friends of color throughout my life. And, I can honestly say from the heart that I have never in my life said anything racist or even thought anything racist, EVER! But, I have been accused of racism, which was so maddening. I appreciate this article. I had some horrible experiences during my graduate experiences at Wayne State University in Detroit. I remember a white woman who would turn and rail at me during the class about my responses to questions. I was really tired during that time frame. The group did not have too many people in it and at the time I was the only black woman taking courses. I was alienated from team work, and treated like I was not a citizen. It was cruel. I did not have as much ugliness to deal with as an adjunct faculty member. I went to a faculty meeting and an adjunct from another health system asked me what was the system used for the electronic medical record. When I said I did not know, she gave me such a horrible look. I was trained to use it. I was not trained to select it. Thanks again! Alienating white people? It’s a hierarchy, this race business. White supremacy is real. It’s about time we white people developed senses of humor and stopped defending our privilege as if we somehow deserved it. I loved this! And as a janitor in an academic institution, I am sometimes amazed at what I hear. (I do speak up; privilege carries the obligation toward its own demise.) Thank you, Aphrodite Kocieda! 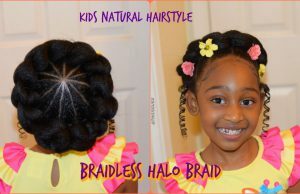 Loving the hair ideas, I need direction 4 my hair. 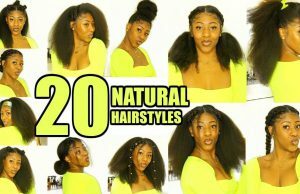 Natural ova 3 yrs, no dye 4 about 1 1/2 yrs. Need good moisturizer. Any advice? Aphrodite, I absolutely applaud your bravery to stand up and draw attention to these issues, especially in Higher Education. I work in the student affairs side of the academy and it’s only marginally better. Now, I will disclose I am a white queer male identified individual, so I do not have your lived experiences, or the experiences of my colleagues, but I have been in many discussions with them and they all express these same issues. I have this idea that I can’t really put words to, but I feel like you could. So I’ll try my best to type it out. Most marginalized people who find their way into academia, usually come to academia with a diversity focus. My assumption is that this is because they discover works that speak to their marginalization as they develop their identity. That makes people want to study it and understand it more. Which then leads to masters and PhD levels of study, where they usually end up working within the diversity side of the house. In academia, diversity studies are hardly respected by the institution and don’t always get respect from fellow educators. Which is where I hear a lot of that rhetoric you were mentioning earlier coming from. And at any point, when you try to point out this disparity, this attitude, this denial of legitimacy, people get labeled as radicals, or they are just being to sensitive. Which then only further marginalizes folks. Kind of in a cycle of oppression-esque manner. Which brings me to my question. Do we create a cycle of marginalization in higher education by limiting ourselves to the diversity education? By which I mean, do we further perpetuate this attitude from the “respected” fields of study by only staying inside our realm of diversity focused work? I don’t know if that was clear because I still haven’t fully processed this phenomenon that I think I’m seeing. But I would love to hear your opinion on it. Thank you again for bringing these issues up and taking that risk. You are a credit to the field! I love your name, Aphrodite. Great post, I still can’t believe there is such ignorance and hurtfulness in the world. Being white for them is an attitude we don’t possess. It is an attitude that states “God has given us the right of dominance over clearly inferior people”. 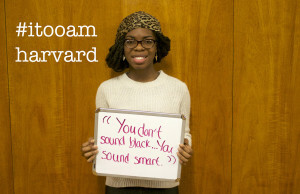 Being black for us is an association of color, complexion or skin tone. Only when we stop seeing ourselves as Black and change our attitudes will we become our greater selves. Not sure how i stumbled on this post. Rest – not so much. I think all of the words are racist, but some of the words came out without noticing it is racist.